"Ganesha," oil on canvas, 36 x 24, 2016. This painting began as a live painting that at The Belly Up in Solana Beach, CA. Throughout the event the canvas went from white to covered, and then the Hindu god Ganesha came together. It sat in a roughly done state for almost a year before I revisited it and brought it to the level of completion that it now sits at. Ganesha is the remover of obstacles. He uses his mind to think through solutions to problems and when he needs to he can use his elephant size to push past issues. 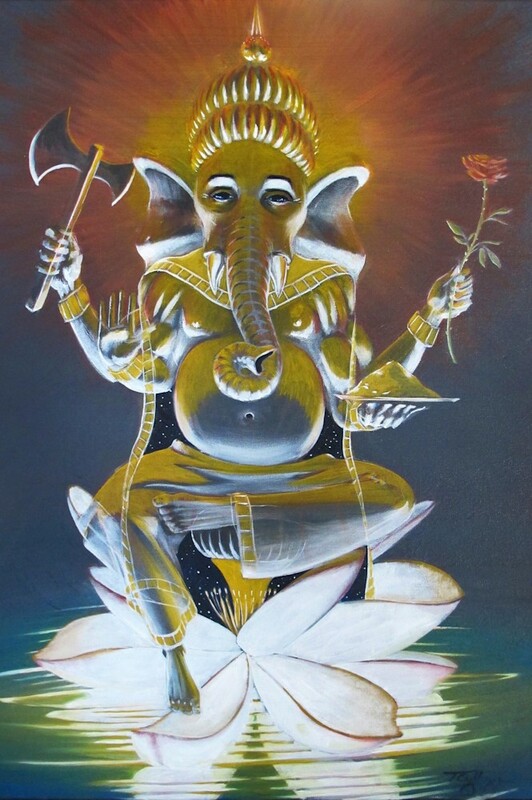 For me Ganesha is a powerful force in that he represents a combination of the mind and the body. I've been enjoying yoga and meditation for a few years now and the blending of the mind and the body leads to an awareness that can open a person up to the soul. This painting was a moving meditation for me, and the entire process was a pleasure. This painting began as a live painting that at The Belly Up in Solana Beach, CA. Throughout the event the canvas went from white to covered, and then the Hindu god Ganesha came together.